Sunday Nov 20, 2005 @ Lula Lounge . such as a beautiful commemorative posters & a 10-CD “Brown’s picks” box set. ALL proceeds going towards funding Canada's proud answer to Havana's call. This ain't just a fundraiser. Please come out in support of Canada's own! Want to come along? Email Teresa Ottens of Mateca Productions. Check out some of her packages (776kb JPG) to attend the festival! country at the Havana Jazz Fest. It's a huge honour. 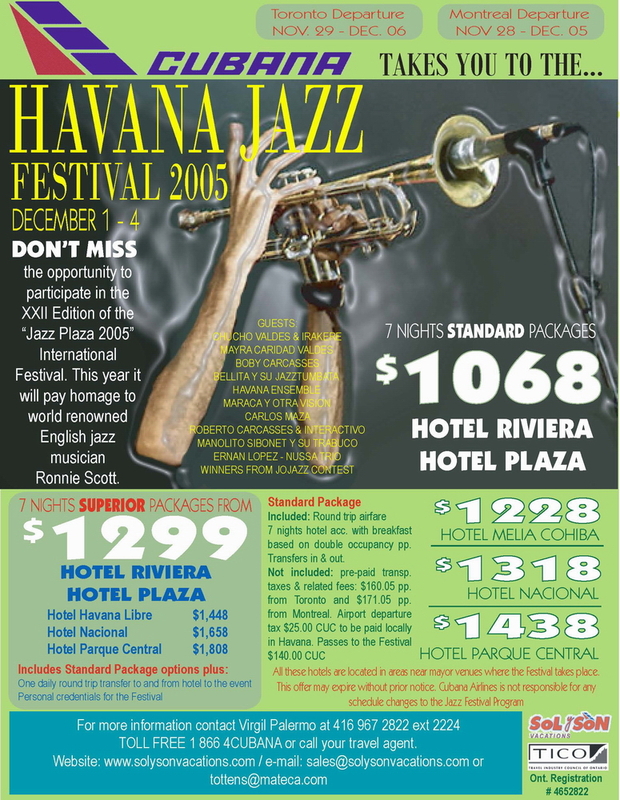 This year’s fundraiser has a new dimension as well, with opportunities that need substantial money in order to come to fruition awaiting Brownman at festivals throughout South & Central America after he finishes once again taking Havana by storm (featured soloist 2002, 2003, 2004). Cubana Airlines has graciously sponsored these worthy Canadian musicians’ return airfare to Cuba, the first vital piece of this puzzle. A successful fundraiser would mean a great deal to look forward to for Canadian Latin-jazz fans in terms of recordings to enjoy, increased prestige for this country’s Latin-jazz community, and much more. Providing a truly phenomenal evening of music and the impetus for fans to support this groundbreaking ambassadorship will be Brownman’s signature Latin-jazz ensemble CRUZAO; and TIGHTROPE, led by Stich Wynston and DNA-enhanced by the horn combo of Brownman and Marcus Ali. 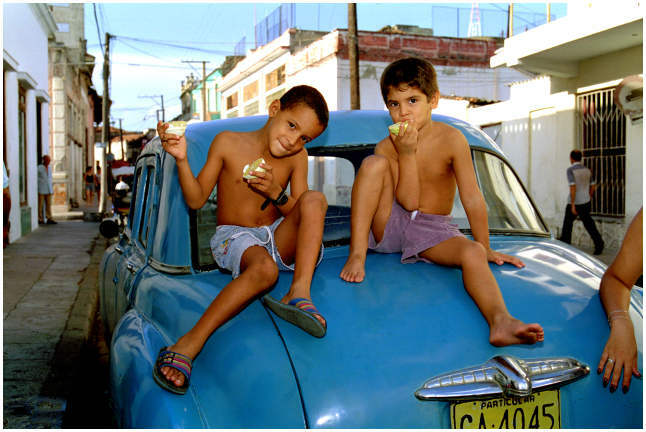 Both of these outstanding bands will be gracing the stage in Havana along with Cuban sidemen; CRUZAO HAVANA will feature an all-Cuban rhythm section and an important goal of this fundraiser is make it possible to pay these worthy Cuban artists a fair wage. Excerpt: "This young multi-award winning trumpeter/composer dazzled Havana in 2002 when he was invited as an individual artist to perform as a special guest with a group comprised of IRAKERE and AFRO-CUBAN ALL-STAR members. 2003 would see him again perform with IRAKERE and further his relationships with other Cubans luminaries..."
Canada's award-winning latin-jazz-funk unit. 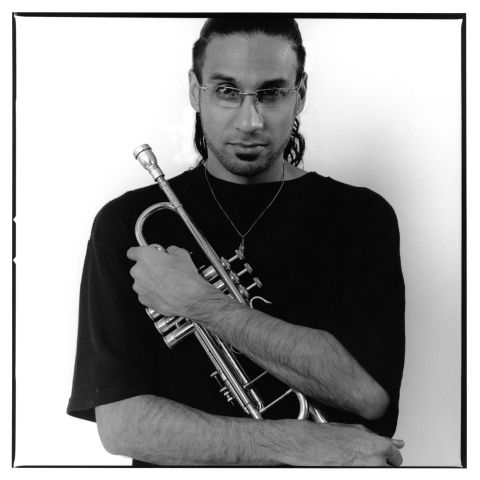 Led by the much in demand and highly decorated Trinidadian born, NYC-trained Toronto-based trumpet playing jazz icon Nick "Brownman" Ali, who himself has just over 150 CD recording credits as a side man and 2 highly acclaimed discs as a leader. CRUZAO's hard hitting latin-jazz-urban sounds funkifies it's audiences with Brownman's original latin-funk compositions and high-energy virtuositic jazz soloists. The amalgamation of authentic latin rhythm, jazz harmony and modern funk groove, this group began it's career as a musical experiment for Brownman in the tonal qualities of latin music composed in a chordless setting (no piano, no guitar) and has flourished into one of the most decorated jazz ensembles in Canada. Nick Ali awarded 2002 National Jazz Award for "Composer Of The Year"
Nick Ali & CRUZAO nominated for 2004 Canadian Independant Music Award for "Alternative Latin Group of the Year"
Nick Ali awarded the 2005 NOW Magazine Award for "Toronto's Best Jazz Artist"
TIGHTROPE is the brainchild of Stich Wynston, drummer for the award-winning SHUFFLE DEMONS and collaborator with among many others: Mike Murley, Jane Siberry, Tom Cochrane, Alex Lifeson of RUSH and Big Sugar. 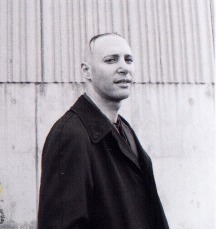 Wynston is a multiple winner of CASBYS and Toronto Jazz Awards, and has appeared on many Juno-nominated albums. He also currently leads longtime friends Mike Murley, Jim Vivian and Geoff Young in his MODERN SURFACES quartet. As the name suggests, TIGHTROPE is dedicated to walking those fine and often precarious lines of risk that defines the best of improvisational jazz – a spirit also embodied to the highest level of musicianship by Brownman and Marcus Ali.